If you read this blog regularly, you might have noticed that we make a lot of soup, especially tomato soup! Is there anything better than a hot mug of tomato soup with a grilled cheese sandwich on a cold winter day? 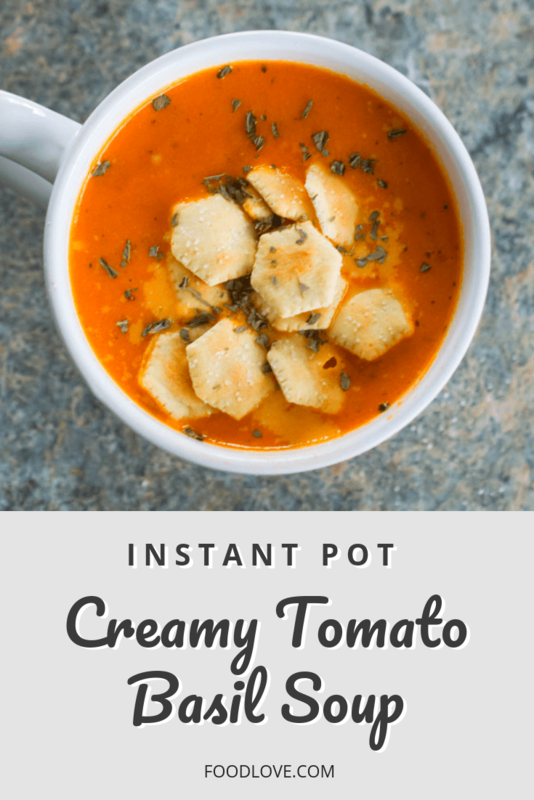 One of my favorite recipes is this Instant Pot creamy tomato basil soup. 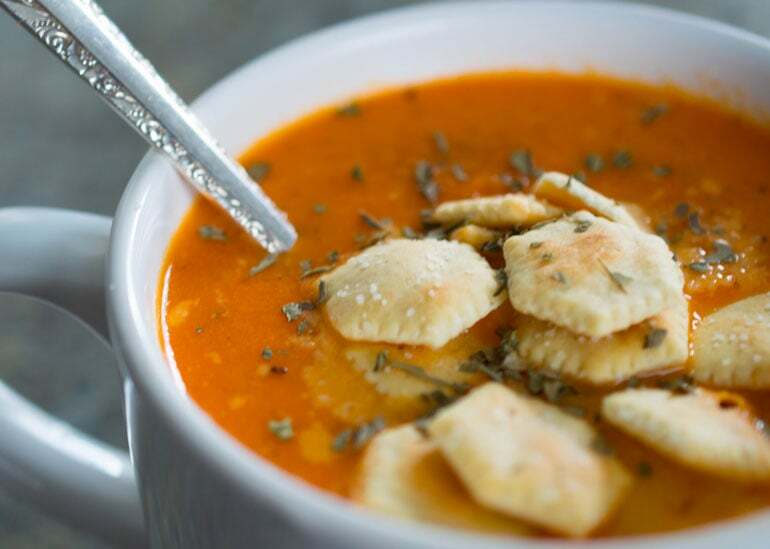 My family loves this soup, and I love it because it’s easy and inexpensive to make. 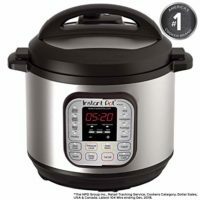 I got my Instant Pot electric pressure cooker more than a year ago, and it’s become one of my favorite kitchen gadgets. The thing I use it for the most is making soup. It has a pre-programmed soup setting, so cooking the soup is automatic. 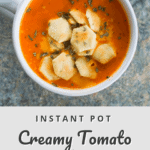 This Instant Pot creamy tomato basil soup is packed with flavor, and with healthy veggies. Just a touch of heavy cream gives the soup richness without too many calories. To begin this recipe, dice one medium onion, two large celery stalks, and two large carrots. Sauté these in a bit of olive oil using the Instant Pot’s sauté setting. Toward the end of the sauté process, add some salt, black pepper, red pepper flakes and dried basil to the veggie mixture. Once the vegetables have started to soften, turn off the heat. Stir in some canned diced tomatoes, chicken broth, and a couple of bay leaves. 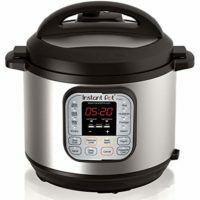 Lock down the lid of the Instant Pot and cook the soup using the automatic soup setting, or cook for 15 minutes at high pressure. Once the cooking cycle is finished, let the pressure release naturally for 10 minutes. Release the rest of the pressure manually and unlock the lid. 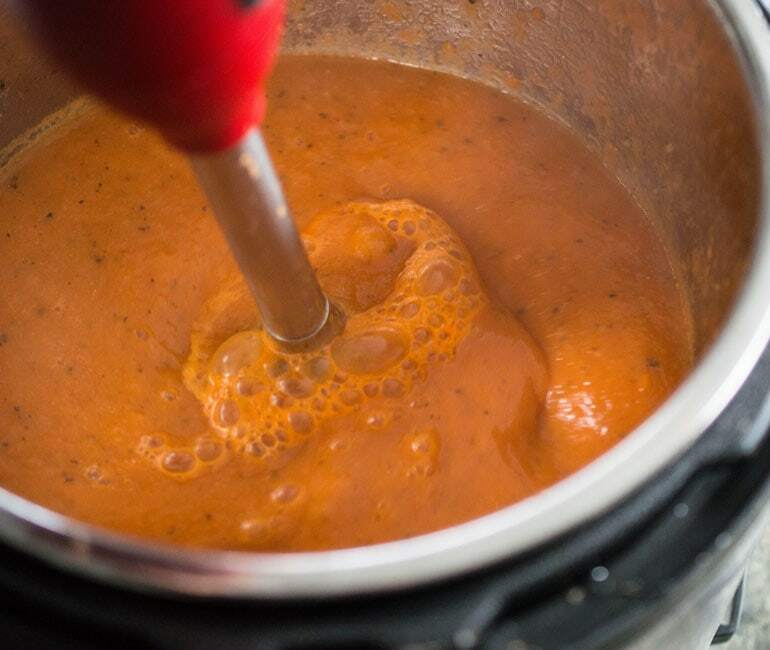 After the soup is cooked, you’ll want to puree it to get it smooth. An immersion blender is the best tool for pureeing hot soup. 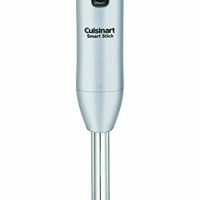 Fortunately, a decent immersion blender doesn’t have to be expensive. The final step is to add a little bit of heavy cream. If you don’t eat dairy, you could skip the cream, or use your favorite vegan milk, like coconut or almond milk. 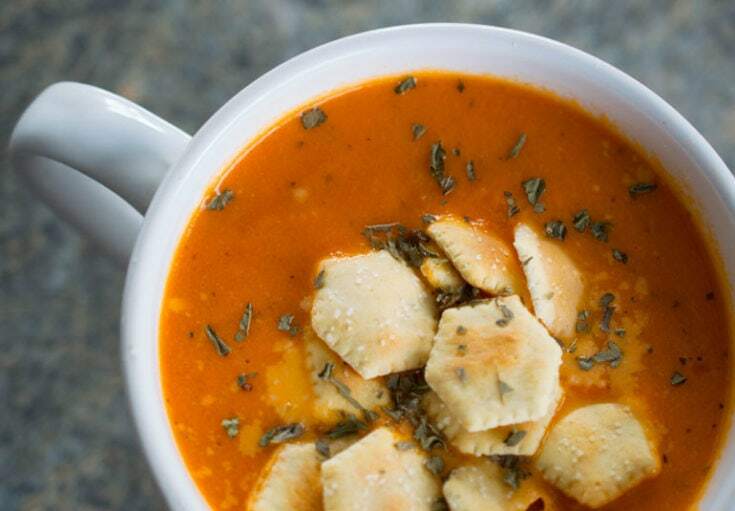 Tomato soup is the ultimate comfort food – hot, creamy and satisfying, but also good for you. 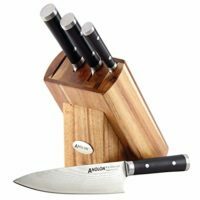 It’s a perfect match for your grilled cheese sandwich, but it goes great with salad, grilled chicken or beef, or just about anything else. If you want a heartier soup, try adding some cooked small pasta (like orzo or ditalini) or cooked rice. Using the sauté setting of the electric pressure cooker, sauté the onion, celery and carrots in olive oil for about 5 minutes. Add the salt, black pepper, red pepper flakes and basil, and sauté for 1-2 minutes more. Turn off heat, add bay leaves, tomatoes and chicken broth, and stir. 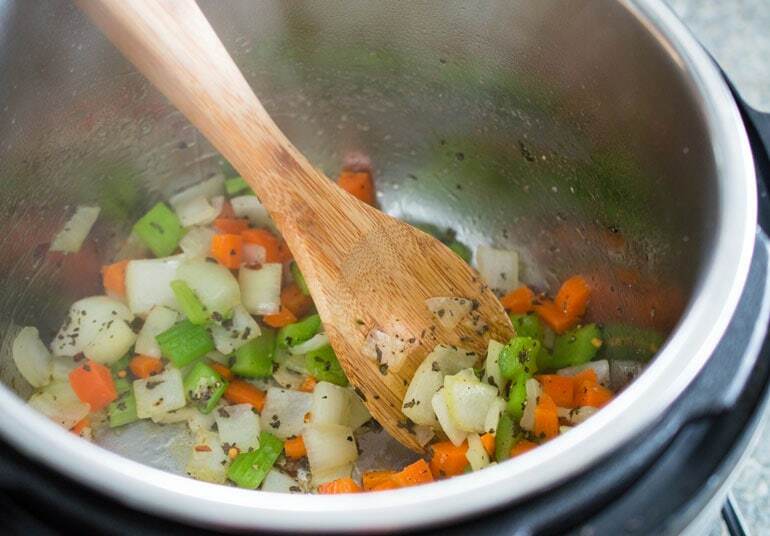 Secure the lid and cook the vegetable mixture using the soup setting, or cook for 15 minutes at high pressure. Allow the pressure to release naturally for 10 minutes, then manually release remaining pressure. Remove the lid. Add the cream, and stir until well blended. Can this soup be made with fresh diced tomatoes? Oh my goodness, that sounds delicious, especially right now when fresh tomatoes are in season! If your tomatoes have thick skins, you might want to peel them first. Do you ever freeze this? Or doesn’t it last long enough? ? It will freeze great without the cream in it, and you can add the cream just before serving. If you freeze soup that already cream in it, the cream might form little clumps. It will still taste great, but it doesn’t look as good. You might be able to smooth out the clumps with a whisk or blender. Good luck, Beth! Made this today and was so delicious. I added the rind of a block of Parmesan. Thank you. Thanks, Jeri! Adding Parmesan is always a great (or grate) idea! I made this today. I used fresh basil and it turned out great. Thank you! I have quart jars of tomatoes that we canned from the garden. Do you think 1 quart would suffice for this recipe? New to the IP and looking forward to trying this? Hi John – Yes, I think a quart of home canned garden tomatoes would be excellent for this recipe! A quart is a little more than two 14.5 oz cans, so maybe hold back 1/2 cup or so of the juice so your soup isn’t too watery. Made it tonight, very easy and so good. Thank you for the recipe. Will make again. Thank you so much, Lil! It really is one of our favorites! I made this tonight, it was so delicious! A nice warm and healthy family meal. I might lessen the red pepper flakes next time (for the kids) and use white pepper. Yummy! I will be sharing this with my IP-friends and making it again soon. Thanks so much, Dawn! You can definitely change up or omit the pepper, or have people add it at the table if they want. I love that I can eat this soup and stay low carb! 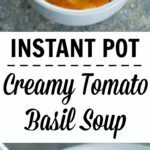 My instant pot is getting a workout this week with the cold weather. 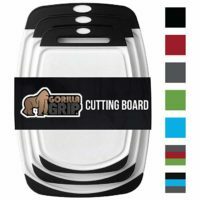 This is great for hubby who works out in the cold and takes it in a thermos so he has a hot meal at lunch also! Thank you so much for this recipe! Agreed, Shelby! I love that this soup is healthy and low carb.